Those were some wise words to remember, and we took them to heart this past weekend. We really wanted to get out into nature to camp, but the weather forecasters weren’t on our side. Here in the second driest state in the nation, they were calling for at least a half inch of rainfall with over 90 percent probability. Add in brisk winds and high temperatures in the 50s, and it simply didn’t seem like an inviting spring weekend to camp. I reluctantly resigned myself to staying home and getting chores done around the house. Hearing about other Grand Adventuring Utahans firing up their motorhomes and hitching up their travel trailers anyway, however, was enough to convince us to bite the bullet and risk it all. I mean, why not? What’s the worst thing that could happen? We arrived at camp and unhooked in the rain. The switch on our front stabilizing jack failed. We developed a bad ground and resulting electrical short in our tongue jack, which sputtered and sparked as we attempted to unhook our trailer from our truck. Really, though, if that’s all that went wrong, I’m chalking that up as a successful weekend of camping! In between rain showers, sun beams down upon Rockport State Park. We fell asleep on Friday night to the relaxing sound of a gentle rain pinging the trailer roof. Thunderstorms rolled through on Saturday and the winds accelerated as we huddled cozy and dry inside the camper, gazing outside in awe of the power of nature. But skies cleared overhead on Saturday night as the center of low pressure retrograded westward across Nevada, and it was not to journey back eastward until Sunday afternoon as we were breaking camp. We witnessed a beautiful sunset across the lake, and we were able to bundle up and lounge around a blazing campfire on Saturday night. Sunday morning dawned brisk but sunny and incredibly still. Rain water inside our kayak had actually frozen overnight! Birds sang from the fir and juniper trees scattered around our campsite. The lake outside our RV’s front door was like a mirror. Admittedly, we did a few things a bit differently this weekend that only aided our success. 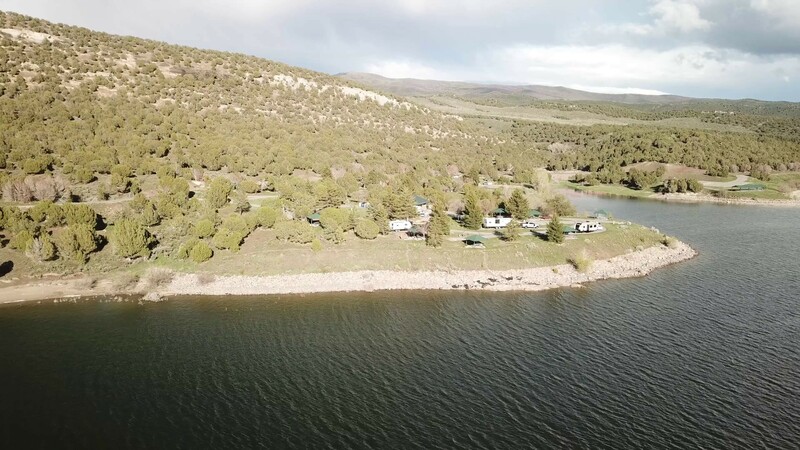 Instead of boondocking as we typically do, we actually broke down and reserved a beautiful site with partial hookups at Rockport State Park in Peoa, Utah. Any dirt roads leading to prime boondocking sites were going to be a mud bog, and the prospect of having 110V AC service from a pedestal, as well as a picnic table covered by a permanent pavilion, was inviting for a rainy weekend. And with such a lousy weather forecast, we were able to score a waterfront site in the park’s normally busy Juniper Campground with only two days’ notice. There were apparently a few others who opted to remain at home and do chores. Parting the clouds (in more ways than one) on Rockport Reservoir. We got out between storms on Saturday afternoon and did a bit of hiking around the park. The lake positively begged for our kayak for a serene paddle on Sunday morning. We broke out the cameras and filmed video for Grand Adventure Episode 34, which will debut on this website and on YouTube tomorrow morning. So remember, the key to successful camping is flexibility. When things outside of your control dictate change, then you simply have to change your plans. We sucked it up and paid for a campsite with an asphalt pad and dry pavilion. We were able to get our front stabilizer extended and retracted using an available remote control, and we’re ordering the replacement switch this week. We located the bad ground on our tongue jack and simply tightened up a few bolts to fix it. And the rain? In retrospect, we wouldn’t have rather stayed home for anything in the world. A bad time camping beats a good time doing nearly anything else, and who’s ever heard of a bad time camping, anyway? Tagged as Blogs, Campground, Hiking, Kayaking, State Park, Utah.